22. "Yad Vashem Holocaust Memorial": Jerusalem. Of all Holocaust memorials, this one reaches both apex and depth of meaning for me. The architecture brilliantly merges form with content, so much so that when I emerged from the claustrophobic darkness into the light and saw Jerusalem outstretched below, I felt a relief and release that was unimaginable. 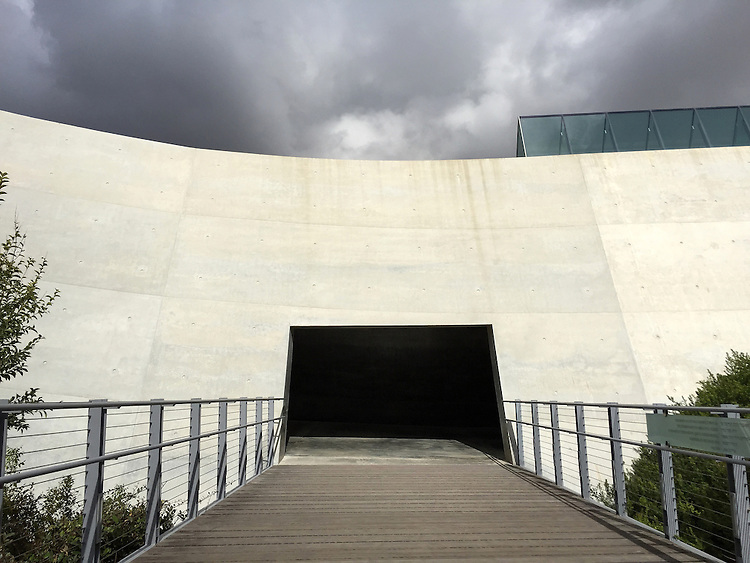 Yad Vashem was established in 1953 as the Jewish People's living memorial. Designed by Moshe Safdie, the History Museum pictured here was inaugurated in 2005. The Museum interior is oppressive: dark, narrow, and in the shape of a spike. One enters a horrific past and exits changed, transformed. In this image, the perspective draws the viewer, inexorably, into a frightening black hole. I did make other images that show a way out and into the light. I am a 2nd-generation American. My parents were both born in the US, but their parents were born in Hungary and Russia. Because of anti-semitism, my immediate family left Eastern Europe at the turn of the 20th century. Those that remained were killed by the Nazis. I have just one cousin, Vera, who survived and bears the numbers tattooed on her arm. The rest perished. This is my memorial.